Figure 2 Competition for space is often an important ecological force structuring coral reefs as corals and other invertebrates cover most of the benthos on healthy coral reefs. Photo credit M.E. Hay. massive corals often have the most potent direct competitive mechanisms (i.e., sweeper tentacles and digestive filaments that can sting and directly harm neighboring corals) while branching corals such as many Acropora spp. 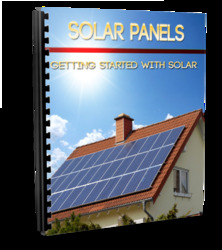 rely on their high growth rates to overtop and shade competitors. Other reef invertebrates such as sponges exude chemical compounds that are toxic to their neighbors, essentially using chemical warfare (termed allelopathy) to gain new space. Although most early studies of competition on reefs focused on coral-coral competition, more recent studies have examined coral-seaweed competition because reefs are now more commonly overgrown by seaweeds that periodically seem to be killing corals. The conventional wisdom is that seaweeds are competitively superior and can overgrow and kill most corals. Although not all seaweeds are harmful to corals, most studies of coral-algal competition show that direct competition from seaweeds reduces the growth, survivorship, fecundity, and recruitment of many corals. Contact with the calcareous green seaweed Halimeda opuntia has even been shown to induce black band disease in some corals. Small, filamentous seaweeds, which are not as directly harmful to corals as are larger, foliose seaweeds, often trap sediments next to coral tissue, and this can smother and kill corals. Thus, even competition with typically innocuous filamentous seaweeds can be harmful on reefs that receive high sediment loads. However, corals are not uniformly susceptible to competition from seaweeds, and competitive outcomes may vary with coral morphology. Foliose corals such as Agaricia spp. 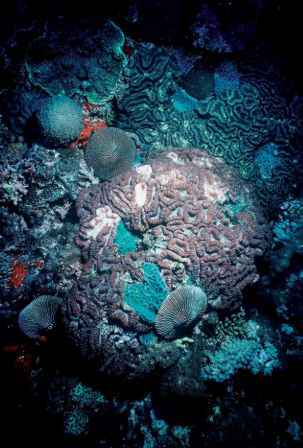 are more susceptible to seaweed overgrowth than massive corals such as Montastrea spp. In addition, seaweeds have disproportionately high negative effects on smaller coral colonies, particularly newly recruited corals, and large stands of seaweed can prevent juvenile corals from recruiting to reefs at all. Competition on coral reefs is not limited to sessile invertebrates; mobile animals also compete. Because herbivores are abundant on undisturbed coral reefs and standing biomass of seaweeds is generally low in these conditions, competition between herbivores would be expected. When the herbivorous sea urchin Diadema antillarum was removed from Caribbean reefs by either purposeful experimental manipulations or by disease outbreak, feeding rates of herbivorous fishes increased, as did the densities of some species, suggesting that fishes and urchins competed for food. Diadema also competed intensely with each other for food. However, competition for limiting algal resources generally did not result in a decrease in the size of Diadema populations but an increase in the size of their mouthparts (called the Aristotle's lantern) relative to the size of their body. Basically, Diadema bodies would shrink in size when food was limiting as a tradeoff between growth and survival.